South Korea and the United States kicked off their weeklong combined exercise Dong Maeng on Monday, replacing the previous large-scale springtime exercises, as announced by the defense ministries of the two sides Sunday. The newly introduced Dong Maeng, a computer-simulated command post exercise, will run through March 12. It is widely understood to be a downsized version of Key Resolve, which had usually been conducted over a period of two weeks. “Dong Maeng” means alliance in Korean. The decision for the change in the combined military drill comes right after the second summit between US President Donald Trump and North Korean leader Kim Jong-un ended without striking an accord on denuclearization or the lifting of economic sanctions. 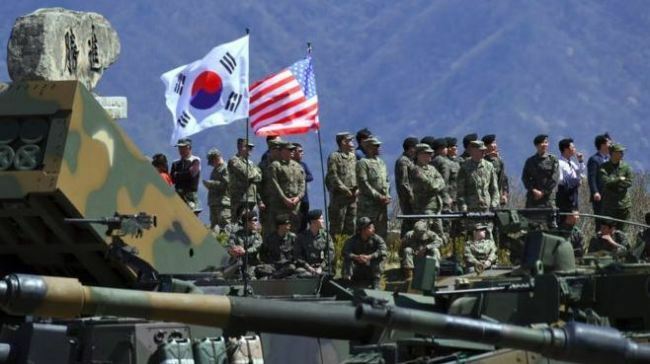 The annual large-scale combined exercises, Key Resolve and Foal Eagle, were abolished Saturday, when Korea’s Defense Minister Jeong Kyeong-doo and acting US Secretary of Defense Patrick Shanahan agreed on the matter via phone. The militaries from the two countries had been carrying out major drills to maintain military readiness to deter North Korea. The Key Resolve combined exercise started in 2002, and Foal Eagle, a field training exercise, began in 1976. Over the phone, the two defense chiefs reiterated close cooperation to ensure their continued combined defense postures, while vowing to back efforts for the denuclearization of the Korean Peninsula. The Dong Maeng exercise is to be carried out on a smaller scale, with the counterattack portion of Key Resolve to be replaced with Rehearsal of Concept Drills. As for the substitution for the field exercise Foal Eagle, the Defense Ministry said it will be reorganized into low-key smaller-scale drills to be conducted at regular intervals. On Sunday, US President Donald Trump tweeted that he does not want military exercises between the US and South Korea because they are expensive and unhelpful for diplomacy with North Korea. “The reason I do not want military drills with South Korea is to save hundreds of millions of dollars for the US for which we are not reimbursed. That was my position long before I became President. Also, reducing tensions with North Korea at this time is a good thing!” Trump said in the tweet. Over the downsized military exercises, concerns have been raised as to the possible weakening of the defense posture, adding to worries over the breakdown of the US-North Korea summit in Hanoi, Vietnam. Still, the Defense Ministry has maintained that the reorganization of the military drills will not influence combined readiness. “With the newly established combined exercise (Dong Maeng) and the revised field exercises, we believe there will not be any problem in the combined readiness,” Choi Hyun-soo, the ministry spokeswoman, said during a regular press conference. A ministry official here said they have fully discussed the abolishment of the combined military exercises and that costs were not the reason, contrary to what Trump had said. Aside from the Key Resolve and Foal Eagle combined exercises, there are also other joint military exercises, such as the Ssangyong exercise in April and Ulchi-Freedom Guardian exercise, a massive computer-assisted command post exercise, in August. The Defense Ministry said it is reviewing options on the scheduled exercises and that nothing has been decided yet.